The cruiser’s main battery consisted of five type E turrets, each mounting a pair of 203 mm/50 cal main guns with maximum elevation of 70°, enough to use them in the AA role. The guns had the maximum range of 29 400 meters and the ceiling of about 10 000 m. The projectile’s weight was 130 kg and the weapon could fire two shots per minute. The ammunition stowage per gun was 100 rounds. Including the reserves, the cruiser carried 1 200 rounds of 203 mm main gun ammunition. The type E turrets were protected with 25 mm armor plates (front, sides and roof). The turrets also featured steel screens protecting them from the tropical heat. Similar screens were also used on enclosed fire control and rangefinder stations. The Takao was the first ship in the Imperial Japanese Navy to feature greatly improved and extended air conditioning and ventilation systems. The ship’s medium artillery consisted of four 120 mm/45 cal guns mounted in single turrets with the maximum ceiling of 10 000 meters. Between 1932 and 1936 the ship carried light AA weapons consisting of two 40 mm Vickers and two 7.7 mm Lewis machine guns. After 1936 the Vickers guns were replaced with a pair of quad 13.2 mm Hotchkiss heavy machine guns mounted on the bridge tower. The Takao carried four twin 610 mm Type 90 torpedo launchers. The revolving tubes were mounted on the main deck’s amidships section with armored boxes (50 mm Ducol steel casing) protecting the torpedoes’ warheads. The ship was equipped with two NO2 Model 3 Kure Shiki 2 Go Shashutsu 3 catapults (from 1932 to 1938) and a pair of reconnaissance Nakajima E42N Type 90-2 float planes. 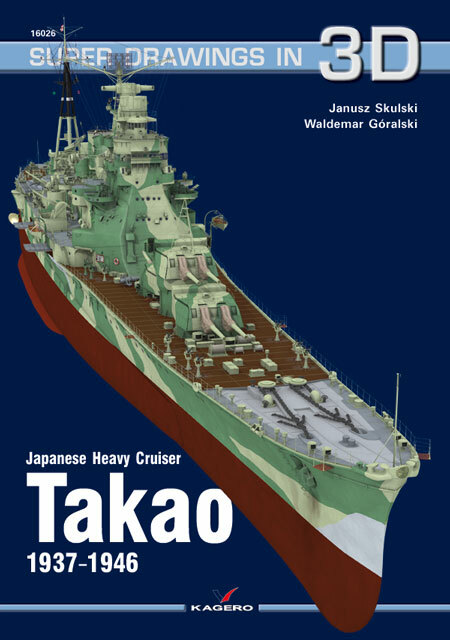 The Takao’s machinery design power output was 130 000 SHP. The propulsion system included 12 oil burning boilers and four steam turbines driving four propellers with the diameter of 8 886 mm. The ship’s fuel capacity was 2 645 tons, which translated into a range of 8 000 nm at 14 knots. As built, the ship’s complement was to be 727 officers and sailors (48+679), but as she entered service the Takao’s crew increased to 761. The Takao’s bridge tower certainly deserves attention. The massive, complex structure was somewhat of a record-breaker in the field of naval architecture. The superstructure exemplified the desire of the Japanese shipbuilders to pack into their vessels the systems and weapons well above the standards used by other fleets. The Takao’s bridge tower was very close in size to the superstructure of the British King George V class battleships. The superstructure was based on the design of the Myoko class cruisers, but although it had almost the same height (31 meters from keel to the top of main rangefinder compared to Myoko’s 32 meters), its internal volume was almost twice the size of Myoko’s bridge tower. The ship’s designers attempted to squeeze as many combat stations as possible into the tower’s ten levels, which resulted in a complex maze of fire control, navigation and communication systems. Special care was taken in the design of the ship’s fire control systems (artillery and torpedoes) allowing day time and night time operations utilizing the superior Japanese optics. This design concept proved its value in the early stages of the war in the Pacific. The Japanese designers chose to build a huge superstructure believing that the centralization of key battle stations and command systems was worth the price of additional weight, drag or the potential large target area. Some of the combat stations in the bridge tower were doubled with their equivalents located on the aft superstructure, above the aircraft hangar. After the Takao’s hull was launched at Yokosuka, a wooden mock-up of the upper section of the superstructure was built (equipped with the actual systems and all details of the battle stations) to test its overall functionality. The testing went on between June and December 1930, which shows how much thought went into the optimal arrangement of the various systems to be installed in the ship’s superstructure. However, when completed, the actual bridge tower differed significantly from its wooden prototype. The total cost of construction of the four heavy cruisers was 113.48 million yen (28.37 million per cruiser). The unit cost was therefore just one tenth of the cost of construction of the battleship Yamato, which came with a price tag of 281.54 million yen. – November 15 – Takao and Atago are moved to the reserve prior to the main modernization at Yokosuka.